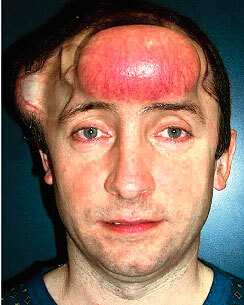 Right: Rosacea eruption almost exclusively localized in the preexpanded forehead skin flap. The most common long-term sequelae of a preexpanded skin flap are retraction, thinning, altered pigmentation, and adnexal changes. A 44-year-old white male of low Fitzpatrick skin photo type (type I, type II) with a superficial spreading melanoma of the right forehead and temporal area was treated with wide surgical excision and immediate repair with a split skin graft. At the end of a 2 year follow-up with no recurrence, a secondary cosmetic reconstruction was carried out, with double expansion of the contralateral forehead and ipsilateral temporoparietal scalp followed by a few minor surgical procedures over 18 months. The final result was functional and esthetic. Two months after the main reconstructive procedure, the patient developed an inflammatory reaction, with multiple papulopustular lesions localized to the preexpanded forehead flap. These lesions were resistant to common skin care and topical antimicrobial ointments. The patient was referred to the dermatologists at our institution, who subsequently discharged him with a diagnosis of rosacea with a prescription of oral and topical metronidazole for 2 months. Although the patient's symptoms were well controlled on this regimen, complete remission was not achieved. 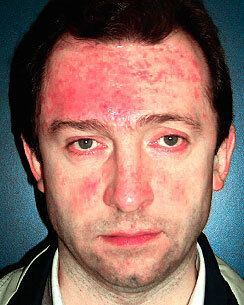 To our knowledge, no correlation between any surgical procedure and rosacea has been reported in the literature. Tissue expansion features a number of histologic changes in the skin. In the early period, the epidermis is increased in thickness, especially in the stratum spinosum, with significant elevation in mitotic activity, flattening of the rete ridges, reduction in the intercellular spaces, increase in tonofilaments in the basal and prickle cells, and a multilaminated appearance of the basal lamina. In the long term, the histologic changes in the epidermis tend to settle back to normal. In contrast to the epidermis, the dermis shows marked thinning, with thick bundles of collagen fibers in the reticular dermis and thickening and elongation of elastic fibers, with signs of fragmentation and disintegration, increased fibroblast and myofibroblast activity, and dilation and hyperemia in the dermal capillary network. In the long term, some permanent dermal injuries persist, with local fragmentation and delamination of elastic and collagen fibers. In expanded skin, alteration in the vascular homeostasis with hypersensitivity to catecholamines, possibly owing to sympathetic denervation, has also been demonstrated. Interestingly, skin expansion and rosacea would appear to share some histologic and metabolic features, as suggested by our clinical experience. Hyperemia, vascular neogenesis, dermal matrix degeneration, and neurovascular adrenergic alterations induced by skin expansion are likely to have triggered this clinical picture in our patient without a history of previous rosacea but a susceptibility to this condition, as demonstrated by the evidence of minor eruptions in his cheeks in the acute phase. Further follow-up suggests that preexpanded flaps may be susceptible to this dermatopathosis owing to common underlying histologic changes because our patient continues to suffer from minor recurrent eruptions exclusively localized to the preexpanded forehead skin.